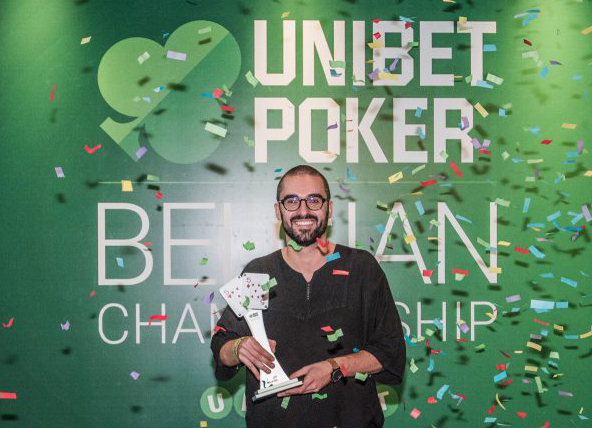 Belgian poker pro and TV personality Christophe De Meulder has won the award-winning Unibet Poker Belgian Championship Main Event for a career-best cash of €42,020. The 30-year-old from Antwerp beat a tough field of 438 entries to take down the €550 tournament which was held in the buzzing seaside resort of Blankenberge from August 29 to September 2. We are Official Travel Partner for the Unibet Deepstack Open tour and the Unibet UK Poker Tour. Forthcoming events are the Unibet Deepstack Open Malta which starts on Wednesday, USDO Cannes from September 28 to October 1 and USDO La Gande Motte at the end of October. The Unibet UK Poker Tour visits Brighton from September 28-30 and Manchester in December. De Meulder, who became a TV star at the age of 10 when he and his twin brother Matthias presented a TV show interviewing celebrities, now has nearly $450,000 in live tournament winnings. He and Matthias also starred in Expeditie Robinson, a Dutch Survivor-style TV reality show. A total of 63 players got a share of the €219,000 prize pool including Unibet Open London winner Gerret Van Lancker, Unibet Ambassador David Lappin and last year’s runner-up Vincent Verdickt. Among the big names who also competed in Blankenberge were former November Niner Pierre Neuville, Unibet Ambassador Daiva Byrne, and two-time Belgian Poker Challenge winner Arne Coulier. Sarah Van Campfort won the €80 buy-in #QueenRules Ladies Event for €1,030 after beating Unibet Ambassador Daiva Byrne heads-up. There were 43 entries with well-known Belgian gamer Charlotte “sjlot” Van Brabander and media influencer Dehlia de Jong also cashing. Forthcoming Unibet events include the Unibet Deepstack Open Malta which starts on Wednesday, USDO Cannes from September 28 to October 1 and USDO La Gande Motte at the end of October. The Unibet UK Poker Tour visits Brighton from September 28-30 and Manchester in December.